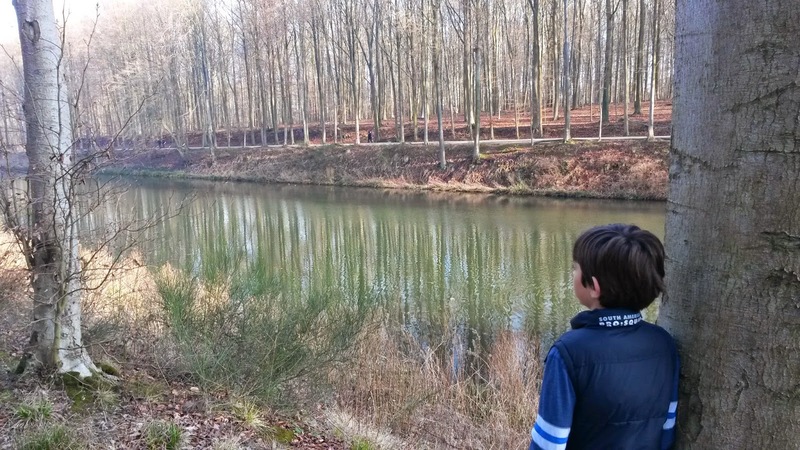 Today was a very long adventure along the river bank of Tervuren park into a forest path close by. Just before we started we discussed where we wanted to go, we decided from 41 to 43 and back would be good. It was approximately 5.2 kilometres but we had to stop with the car at 48 so it was plus half a kilometre. On the way there was a problem, we were on the way to 44 and we had planned to use a shortcut going back or then it would be too long of an adventure (adventure = walk). But the shortcut was closed because it had a sign next to it saying do not enter (in Dutch of course). Then we found out there was a bit of a road we could get into with a bigger shortcut but there was a mini great wall of China so we got worried. But as we went the mini great wall of China had ended so we could get in to the road. As the adventure came to an end we had to choose between two ways. I decided to stay close to the river bank and I had chosen the right way because it was shorter than we thought compared to the other way. I decided to take a picture of myself looking at the lake. We had an excellent time just like a real adventure and I will see you later. 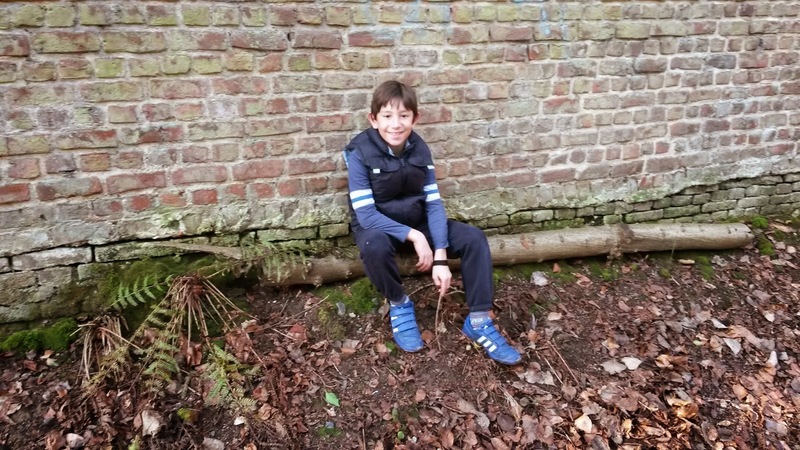 After a long break, mostly due to Gianluca attending scouts, or football, or my own long distance training, plus lots of bad weather for good measure, we finally found the time to resume our 'adventures' in Dijleland. 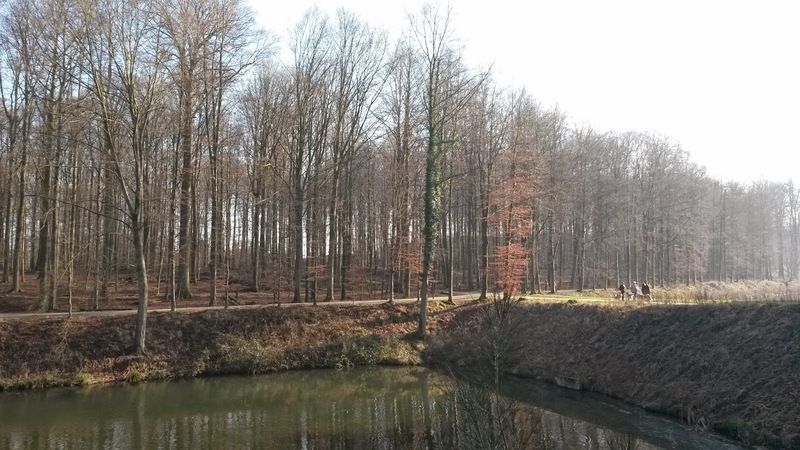 Today's walk was mostly in the Tervuren park. We started from 41, walked along a straight path next to an artifical lake to 42 closer to the middle of the park. Towards 43 and then 44 we walked outside the perimeter wall of the park. We were supposed to go on to 44 and on the way back take a short cut back to 41, otherwise the walk would be too long, and we were getting tired. But, on the way to 44 we saw that the short cut to 41 would be inaccessible. On the map it showed that if we went further ahead the path would pass next to a street from where we could take a short cut to 41, however we were not sure if that short cut was accessible or not, and if it was inaccessible the way back along the same route we had done would be even longer. We took the risk and walked on, and it turned out that the street leading back to 41 was accessible. Good thing, otherwise it would have been a very long way back. Each adventure is unique in its way. One thing they have in common is that they're always a pleasant experience. Today's was no exception. Now we're looking forward to a very special adventure indeed. Three full days in Skopje, Macedonia!